The Rocky Mountain Section PGA is pleased to offer the 2019 Golf Pass in an electronic version. The Golf Pass offers discounted rates at 70 golf facilities in parts of Idaho, Nevada, Montana and Wyoming. As a Golf Pass holder, you will be able to enjoy golf at the region’s best courses at only a fraction of the costs. All of this for only $40. By purchasing the Golf Pass you can save hundreds of dollars on green fees, cart rentals, range balls, merchandise and golf lessons! 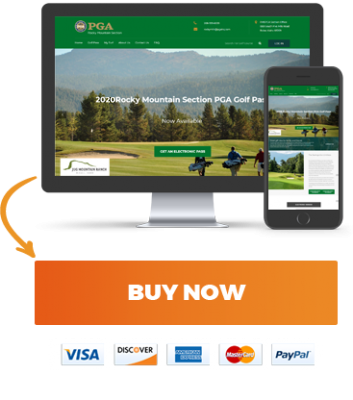 Once you purchase your electronic Rocky Mountain PGA Golf Pass you will receive an email with your login credentials that will provide you with an online account where you can redeem your discounts using your mobile smartphone or tablet. Each facility and their discount are listed on the My Turf tab. If there are any exceptions as to times and days the discounts are available, they will be noted there. At the golf course simply show your photo id and phone when checking in, pay special rate and the attendant will tap your phone to reflect that the discount has been redeemed. It is that simple. The savings with the Golf Pass are truly limitless. The more you use the Golf Pass and take advantage of its benefits, the more you save. The Electronic Golf Pass will be used through your electronic devices, whether that is your phone, tablet, or computer. You WILL NOT receive a hard copy booklet. When purchasing the electronic version, you will be emailed an account username and password that you will use to gain access to all of your offers online. All 2019 Rocky Mountain PGA Golf Pass members will receive a FREE weekly grounds ticket to the 2019 Albertsons Boise Open, Idaho’s only PGA TOUR sanctioned Web.com event. The Albertsons Boise Open will be held August 22-25 at Hillcrest Country Club in Boise, Idaho. The grounds ticket will be mailed to you by the end of July in plenty of time before the tournament. What a great opportunity to see some of the future stars of the PGA TOUR and save money doing it! This is a value of $35. What is the Rocky Mountain PGA Golf Pass? The Rocky Mountain PGA Golf Pass offers discounted rates at nearly 70 golf facilities across parts of Idaho, Montana, Nevada and Wyoming. By purchasing the golf pass, you can save hundreds, even thousands, of dollars on green fees, cart rentals, range balls and merchandise. Once you purchase your electronic Rocky Mountain Section Golf Pass you will have immediate access to the Pass on your mobile device. SPECIAL BONUS - All Golf Pass purchasers will receive a weekly grounds pass to the 2019 Albertsons Boise Open, Idaho's only PGA TOUR sanctioned Web.com event. The Albertsons Boise Open will be held August 22-25 at Hillcrest Country Club in Boise, Idaho. The Boise Open ticket will be mailed to you around the end of July in plenty of time before tournament week. How Much Does the Golf Pass Cost? The 2019 Rocky Mountain PGA Golf Pass is yours for only $40! For this exceptional price, Golf Pass holders will also receive a FREE weekly grounds ticket to the 2019 Albertsons Boise Open, Idaho’s only PGA TOUR sanctioned Web.com event. How Do I redeem the discounts on the Electronic Golf Pass? Redeem = This button will be used once presented at the golf course. You will hand your electronic device with your selected offer to the golf course attendant, along with your identification, to redeem your online offer. Once the attendant selects this button, one (1) usage will be taken away. Save the Offer = This button will be used to save your offer for future use. Once saved, you can check your saved offers by clicking on MY ACCOUNT, and from there you can click SAVED OFFER. How Do I Know What Facilities Are Included? How Do I Order the Rocky Mountain PGA Golf Pass? Ordering is easy? You can Click Here to order online using a credit card. We accept Visa, MasterCard, American Express and Discover. You will receive an email with login credentials that will provide you with an online account where you can redeem your discounts using your mobile smartphone or tablet. The Rocky Mountain PGA Section is 1 of 41 sections that make up the Professional Golfers’ Association of America. The national body consists of over 27,000 members and apprentices. The Rocky Mountain PGA Section membership includes over 250 golf professionals employed at 123 facilities.